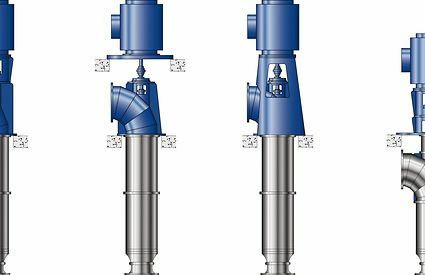 KSB’s tubular casing pumps of the SEZ, SEZT, PHZ and PNZ series are ideally suited to transporting seawater in desalination plants and to handling cooling water in power stations and industrial plants. Tubular casing of an SEZ pump Be it water extraction or water supply, KSB’s tubular casing pumps ensure top efficiencies and absolute reliability even when pumping huge amounts of water. KSB’s tubular casing pumps are perfectly suited to long-term operation. The largest advantage of KSB’s tubular casing pumps: They are fitted with KSB-developed, maintenance-free, wear-resistant RESIDUR ceramic bearings. KSB’s RESIDUR ceramic bearings are able to cope with continuously high loads and demonstrably reduce life cycle costs. All tubular casing pumps can be retrofitted with KSB’s RESIDUR ceramic bearings. KSB customers are supplied with a pump tailored to their needs, with high efficiency and favourable NPSH characteristics. KSB’s service does not stop with production. KSB is right behind their customers also after their tailored tubular casing pump has been delivered.